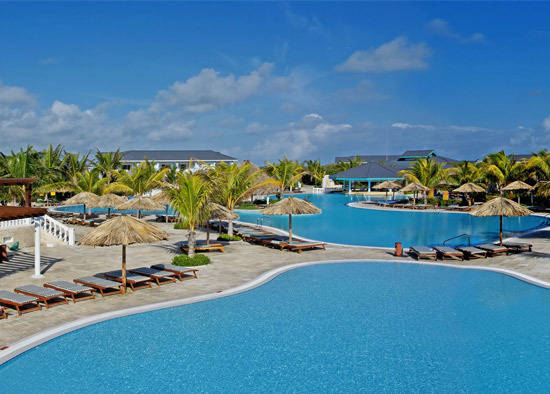 Melia Las Dunas 5* All Inlcusive Resort is located in Santa María cay which is part of Jardines del Rey archipielago. A wide strip of white sand, crystal clear waters of blue turquoise color, wild green vegetation and a rich variety of endemic fauna makes this region, declared Reserve of Biosphere. Ranks as one of the most exotic areas of the whole Caribbean. Two ambiances are clearly recreated, one, devoted to families; the other, to couples. 10 km from the National Airoport Las Brujas and 110 km from the International Airoport Abel Santa María. À la carte Grill Restaurant "Los Siboneyes"
Aqua Bars "La Laguna" & "La Gruta"
Lobby Bar "Jardín del Rey"
Discotheque / Karaoke "La Burbuja"
Activities programme: aerobic, archery, basketball, beach volleyball, bikes, pool tables, bowling, darts, climbing wall, french bowls, ping-pong, etc.